All-inclusive! $TBD including, transportation in Ecuador, haciendas and quality hotels, all meals, guided tours and hikes. See our FAQ and the detailed itinerary for complete information. Ecuador is a country of great geographic and cultural variety. Imposing snow-capped volcanoes, lush emerald green valleys, cloud forest, virgin Amazon rainforest, warm Pacific Ocean beaches and the incomparable Galapagos Islands 600 miles from the mainland. In the Ecuador highlands, we will stay at 17th century historic retreat haciendas that have been converted into Ecuador's finest country inns. Available extensions include the Galápagos Islands, climbing volcanoes, and rainforest tours. 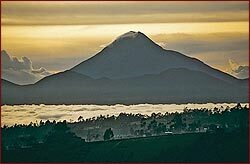 The Ecuador Running Adventure is held at the same time and overlaps with the Ecuador Hiking Adventure. It is possible for one person to participate in the Running Adventure and another in the Hiking Adventure and spend every night together. Each group has separate transportation, tour leader and guides, however we spend every night at the same haciendas and hotels. It is also possible to do either the run or the hike on any day. We can accommodate your choice! Check with us for details!